Ok folks, calm down. Now, some of you who spent some time in their youth not conforming to the norms may recognize that substance up there. It’s camel dung compressed into a brick. No.....that’s not true. But it is the subject of todays post. Well, no. That’s not true either. It shares the name of todays subject. Here’s the deal. I forgot yesterday was Monday. I guess I was having too much fun fixing my mower and then mowing the lawn and cooking steak for dinner and stuff. So here it is, Tuesday morning, and you’re going to get a quick and dirty oddity. To answer everyones qwextshuns, that stuff up there is hashish, or hash for short. And if you read my post in todays Roll Call, you know where this is going. In it’s simplest form, food. But what got me started on this was, I made some breakfast. It included hash browns. And I wondered where the name came from. So I looked. And it’s kind of boring. But I’ll tell you anyway. Hash browns are actually called Hashed Browned Potatoes. But because people are lazy, they shorten it to hash browns. The reason they are called Browned Potatoes should be obvious to anyone who has ever had them. They are after all, browned potatoes. But what about the hashed? Well......here’s where it gets boring. 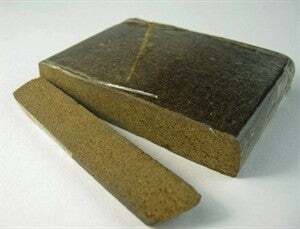 I was hoping I’d find some exotic reason like, hashish smugglers first made them because it was quick, and they were always on the run from the authorities. Or that they used their hashish in the cooking of potatoes. The word Hashed comes from the French verb ‘Hacher’, to chop. So they are literally ‘chopped browned potatoes’. And that stupid French verb is where we get the generic term ‘hash’. When it’s talking about the food, it’s because it was first developed as a way to use up leftovers. You took whatever you had left and chopped it up and fried it. People have tried to take credit for inventing hash as a food, but really? People have been chopping up leftovers and frying them for ever. During World War Two it became popular to chop up leftover roast beef or corned beef and add it to chopped up potatoes and serve it with eggs for breakfast. It was a simple way to take smaller amounts of rationed meats and stretch them to feed a lot of people. While hash and hash browns have been around for a very long time, they didn’t really start to become popular until the late 1800's. That’s when diners started serving it for breakfast as a way to get rid of the previous nights leftovers. It soon became one of the most popular diner foods. What you get when you order hash depends a lot on where you are. Every region has their own version, and most every country has their own as well. Some are better than others, but I’m not going to judge. Except for in Oklahoma where they will sometimes use calf brains. I’m totally judging that. And it fails. Brains are not food. I guess that’s all I got today. I mean, I could go on and on about all the different regional hashes, but I don’t really want to. It’s not because I’m lazy, (I am....), but because I could write an entire thesis on the different hashes. And if I wanted to write a thesis, I’d get my doctorate. Hmmm......do you suppose a chef could go back to culinary school to get a PhD in cooking? Would they be Dr. Chef? And if they used their doctorate to teach, would they be Professor Dr. Chef?